Hyyer Sea Lion Plush Animal Head Hat Healthy, Safe, Movable Hat Ear Add Charm, Multipurpose, is Perfect Gift. - Sea Lion Head Cap Made of high quality materials, Soft and Comfy, is healthy and safe Clothing Accessories your family and friends. Sea Lion ear that can jump and move when paw is being pressed. Must press double Airbag, the Animal Ear can jumping. - If you like happy selfie with friends, Hyyer Funny Plush Bunny Hat will make you more beautiful in photos. Own Animal Head Hat, You must be most fascinating when you attend a party or some event. - Easter Hat, Christmas Hat, Winter Hat, Halloween Hat, Kids Hat, Plushy, Toy, Cap. It Is Able To Keep Warm Too. 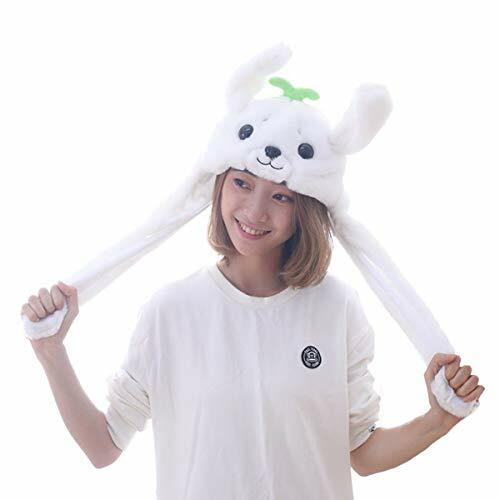 Moving The Animal Ear hat would make your wife, kid and other women friend satisfied, you will get more smile and love visa Animal head hat cap. Since manual measurement may have a 1-2cm error (note: 1cm = 0.39inch), please understand. Color deviations may vary due to different monitor settings. We provide you with the best products and services. Any questions, let me know. thank you very much. ✔【 HEALTHY & SAFE 】- This Costume Accessory with The Ears Made of high quality materials, Soft and Comfy, will be healthy and safe toy for your family and friends. ✔【 MOVABLE HAT EAR 】-The Sea Lion Ear can jumping when press double Airbag, because Tik Tok DOUYIN Toys designed for fun. ✔【 ADD CHARM】-If you like happy selfie, Hyyer Funny Plush Animal Hat will make you more beautiful in photos. Own Sea Lion Head Hat, You must be most fascinating when you attend a party or some event. ✔【 MULTIPURPOSE 】- Easter Hat, Christmas Hat, Winter Hat, Halloween Hat, Kids Hat, Plushy, Toy, Cap. It Is Able To Keep Warm Too. ✔【 PERFECT GIFT 】- Moving The Sea Lion Ear hat would make your wife, kid and other women friend satisfied, you will get more smile and love visa Animal head hat cap. If you have any questions about this product by HYYER, contact us by completing and submitting the form below. If you are looking for a specif part number, please include it with your message.